14 February 2017: Like many other Greek communities, Athens was not prepared for the arrival of thousands of refugees in the summer of 2015. Mayor Georgios Kaminis said that a city with little infrastructure or experience in refugee reception suddenly found itself at the forefront of the biggest refugee movement since World War II in Europe. But the Mayor quickly realised that the extent of the humanitarian crisis required immediate action. Within weeks, the City of Athens had established the country’s first refugee centre. Since then, Mayor Georgios Kaminis has been unwavering in his support for the neediest in society. An NGO testified that the reception refugees and asylum seekers received in Athens was among the best in Europe. 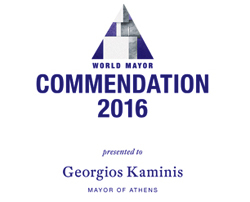 Georgios Kaminis has been Mayor of Athens (population 665,000) since January 2011. He was re-elected in 2014. Born in New York City, his Greek family returned to Greece when Georgios Kaminis was five years old. In 1980, he obtained a law degree from the University of Athens and two years later a post-graduate diploma in public law from the University of Paris. After several years work as an academic, he became assistant Greek Ombudsman, responsible for human rights. 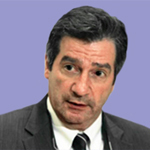 From 2003 until he decided to enter local politics, Georgios Kaminis was Greek Ombudsman. Supported by the Greek Socialist Party PASOK, the Green Party and a small centrist party, Georgios Kaminis defeated the conservative incumbent Mayor Nikitas Kaklamanis in the second round of voting of the 2010 mayoral election. Four years later Mayor Kaminis defeated the candidate from the leftist SYRIZA, again in the run-off. The Mayor and the municipal authorities quickly realised that the crisis was not short-term and that the City of Athens had a moral obligation to provide safety, shelter and food for the refugees. Mayor Kaminis says that being aware of the severity, scale and extent of this humanitarian crisis, he decided to dedicate a municipal space for the creation of the Elaionas camp. Established in August 2015, Elaionas was the first temporary accommodation centre in the country. It currently provides shelter to nearly 2.400 refugees. As a principal in the international non-profit consulting firm, Bloomberg Associates, I have had the privilege of working with Mayor George Kaminis over the past two years, supporting the Mayor’s work on shaping a strategic vision for the city and creating effective management and accountability for delivering on that vision. In that context, the Mayor has inspired me with his commitment to care for the neediest in a compassionate, effective and efficient manner. It is within this broader context that he has embraced the overwhelming demand placed on the city with the influx of refugees over these past years. He has set a clear and uncompromising direction to this entire administration  we shall welcome them, care for them, and support them. His unwavering voice set the tone for the entire city and presented a civic welcome to the refugees unlike any other they received across the continent. For this leadership, he deserves recognition as Mayor of the year. Mayors are the front line of services to citizens across the globe. Voicing values of inclusion, tolerance and care as the highest level order cities must stand for and Mayors must represent.